The cottage is equipped with everything you need and furnished to a high standard.It is detached and has a large private terrace ,gardens and parking.Privately owned and run to a high standard.Not on complex. There is a local shop 1 minute away,only 5 mins away there are supermarkets and authentic inexpensive Turkish restaurants. Leading from the hall ,with its book library, is the living room ,its is large and spacious and comfortably furnished with a pull out sofa bed and stone fire place. (fold out bed and cot also available)T.V.D.V.D player and selection of D.V.D.s games and books. The kitchen leads from the living room,it has a table and chairs for 4 and is fully equipped for a self catering holiday. 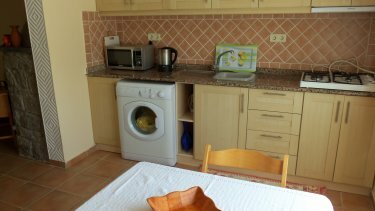 Microwave, grill and hob for your culinary requirements.Large fridge freezer to store food you may have brought with you.Washing machine also in kitchen. 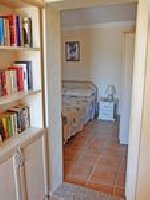 The bedroom is large and has a comfortable ,good quality double bed as well as plenty of storage space,leading from this is the large en -suite shower room with electric shower for hot water.All linen and towels are fresh and clean. All rooms are air-conditioned.Smoke alarm in hall. The terrace is wonderful for entertaining plenty of room for eating outside or reading a book in the shade of the lemon tree. The cottage is situated in Gunlukbasi village,10 min walk from Calis beach or 5 min by bus. 15 min bus ride to Fethiye,a traditional working town with a magnificent harbour,large range of shops,restaurants and bars. Gunlukbasi village is the real Turkey close to authentic Turkish restaurants and shops.Weekly Sunday market with a huge range of fresh fruit and vegetables. 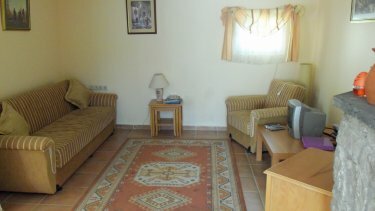 Please note Gunluk cottage can also be rented with Gunluk house(5909) 3 bedroomed apartment close by. Owner is close by so will meet you when you arrive and depart, is avaliable for any information you require to have a good holiday. Shared pool you can use at the hotel across the road if you fancy a swim or sun bathing.Just buy a drink.The hotel also has darts and a pool table offers a delivery service to the cottage from its inexpensive menu. Regular bus service to Fethiye and Calis beach close by. Oul deniz the blue lagoon is 15 mins away by car with its turquoise water and golden sand. Historic sights such as Greek village of Kayakoy,Xanthos,Patara and Efesus can also be visited. The prices above are for 2 people, For 3 or 4 people �25 per person per week. �100 damage deposit is required, refundable if the cottage is left clean tidy and no damage. 50 units of electricity per week are provided ,(this is a lot) if more is used it is charged for. Dalaman airport is 45 mins away,i can arrange transfers and car hire,please ask for a quote.